Summary Four bay RAID 5 class NAS with one Gigabit Ethernet port powered by dual-core Marvell CPU. Summary Four bay RAID 5 class NAS with two Gigabit Ethernet ports powered by dual-core Annapurna Labs CPU. We sometimes review NAS families by looking at two-bay and four-bay models based on the same hardware components in one review. However, because of Synology's release cycle, we reviewed the DS-216j last month - more than a year after reviewing the two-bay DS216, which was released in late 2015. Synology's "j" series NASes are entry level products aimed at the Personal/Home market. Models without the j suffix are part of the Value Series targeted at the Home/Workgroup market. 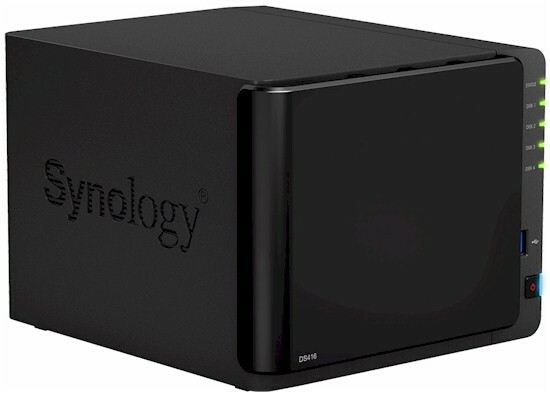 This review will compare Synology's four-bay DS416 and DS416j. These are not just retreads of the two-bay NASes previously reviewed. Both the DS216 and DS216j were powered by a Marvell ARMADA-385 88F6820 @ 1GHz. The DS416 is powered by a Dual-core Annapurna Labs Alpine AL-212 @ 1.4 GHz, while the DS416j is powered by a newer Marvell ARMADA 388 88F6828 @ 1.3 GHz. In addition, the DS416 boasts 1 GB of RAM - the other three models have only 512 MB. The chart below, generated from the NAS Finder, shows the basic differences between the DS416 and the DS416j. 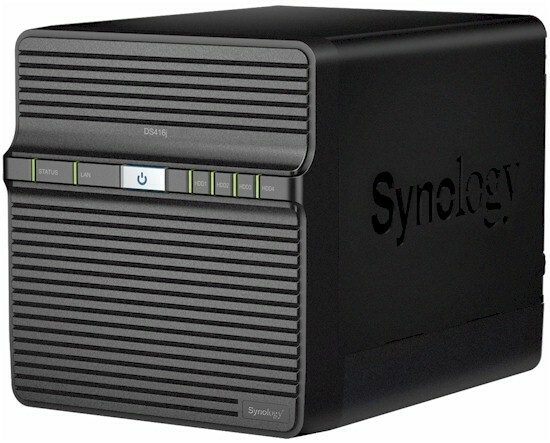 A complete comparison of the two is over on Synology's site. In addition to the differences in processor and memory, you'll note that the DS416 has two Gigabit Ethernet ports. It supports load balancing, failover, and link aggregation. I'll highlight other differences in the callout charts. The callouts and LED indicator key chart below shows the front and rear panel layouts for the DS416. Note that the DS416 has three USB 3.0 ports - two on the rear panel and one conveniently located on the front panel. The DS416 does not have USB 2.0 ports. Also worthy of note, the two Gigabit Ethernet ports each have separate indicators for link/activity, and a LED that shows link connection speed. Installation of the disks on the DS416 is quite simple. Just open the front panel, insert the disks into the trays, and then snap the side rails into place. No tools are required. You can download the Hardware installation guide here. The callouts and LED indicator key chart below shows the front and rear panel layouts for the DS416j. The single Gigabit Ethernet port indicator is on the front panel and indicates only link/activity/no network. The DS416j has only a single USB 2.0 and a single USB 3.0 port - both located on the rear panel. Installing drives into the DS416j is a bit easier than in the DS216j. You undo four thumbscrews and flip down the rear fan panel to reveal the drive bay and plastic disk trays. Unlike the DS416's trays, the j's trays require screws to hold the drives in place. The DS416's drives are hot-swappable; the DS416j's are not. You can download the DS416j Hardware Installation guide here. It was relatively easy to get the photo of the DS416j's board shown below, once the metal case and drive trays were removed. No so with the DS416, so no photo for it. The table below shows the key component summary for the two Synologies. The DS416j drew 27 W with four of our stock WD Red 1 TB (WD10EFRX) drives spun up and 7 W in power save mode with the drives spun down. Noise was rated very low, with neither noticable fan nor drive noise. The DS416 drew 23 W with four WD Red 1 TB (WD10EFRX) drives spun up and 9 W in power save mode with the drives spun down. Noise was rated low because fan noise was noticeable in a quiet home office. The DSM 6.0 OS allowed bad block checks to be skipped with creating RAID 0 and 10 volumes, but not for RAID 5. It took about 10 minutes for RAID 0 and 10 volumes to complete parity checks for a volume built with the four 1 TB drives. A RAID 5 volume built from the same drives took ~ 3 hours to complete a parity consistency check for both products.